Fox makes a bid for Downing Street Jump to media player Journalists waiting outside 10 Downing Street spot a fox, apparently chasing a duck. Legal details to get election under way Jump to media player Election writs are issued to all 650 constituencies as part of the formal process to start the general election. What if there is no majority in May? Jump to media player What are the possible scenarios if no one party gets a majority in May? Ross Hawkins has a look at the options. Concerns of the 'grey vote' Jump to media player One of the groups being targeted by the political parties is the vote of the elderly. 'Britain is back on her feet again' Jump to media player David Cameron says he has begun the task of "turning the country around" and wants to "see the job through", as the election campaign gets under way. Business in a 'sea of insecurity' Jump to media player Ed Miliband says that the business world in the UK is in a "sea of insecurity", exacerbated by concerns over future EU membership. 'We want Cornish assembly within UK' Jump to media player Mebyon Kernow stands for seats in Cornwall and is looking for an assembly for the county, but not full independence. The general election campaign is under way, after Parliament was officially dissolved. 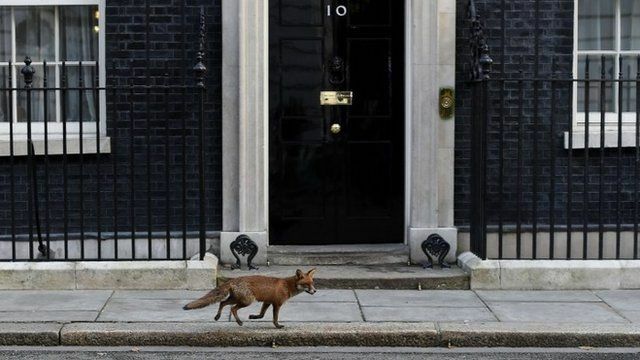 Journalists waiting outside 10 Downing Street on Monday morning spotted a fox, apparently chasing a duck.